A few trick plays have been some of the only highlights of this otherwise poor Bears season, and Chicago sprinkled in another one for their final game of the year. On a punt return against the Vikings, the Bears pulled off the always-satisfying decoy punt return, with Tarik Cohen serving as the bait and Bryce Callahan taking it to the house by hiding near the sideline. 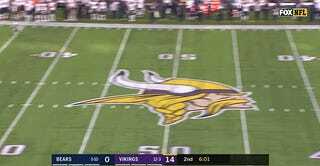 Here’s a good still from the replay, in which zero Vikings are looking at Callahan. Minnesota’s gonna have to fix that.